Andrea, Shannon, and Fred dip into casting news, the release of Tiamat’s Wrath (no spoilers! ), and PHLCC, before diving right into an in depth discussion of the Kickstarter backer’s release of the RPG, and what to expect if the hosts play a campaign. We’re back! 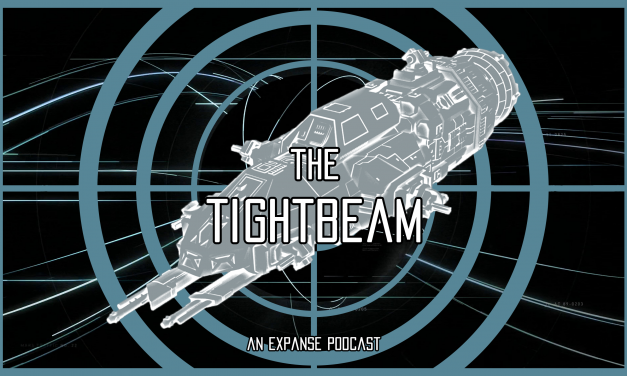 Andrea and Shannon are joined by Fred as they recap the last few months of Expanse-related news both big and small, including the worldwide launch on Prime Video, Season 4 casting, the RPG game, and what to expect from the Tightbeam until The Expanse returns! Shawn Doyle joins Andrea and Shannon to discuss his role on The Expanse, his motorcycle, handstands and musicals, and even turns the interview on our hosts! Shannon and Andrea are joined by serial Expanse die-er Elias Toufexis for a fun interview about gaming, motion capture, Protey Rights, and dying. A lot. In this episode of The Tightbeam, Jules-Pierre Mao himself, Mr. Francois Chau joins Andrea, Lou, and Shannon for a fun interview, discussing how he got into acting, how it feels to almost always play a villain (or someone’s dad), and more! Bob Munroe, Senior VFX Supervisor for Seasons 1-3, joins Andrea, Lou, and Shannon in an in-depth interview about The Expanse, VFX, the film industry, and what it’s like to have dolphins oversee his research. In our first hiatus episode, we take a look ahead at Season 4, what’s next for The Tightbeam, and have an incredibly fun, wacky, and insightful interview with Tyler Blake Smith AKA Mao’s Bodyguard (RIP). The Roci may have a speed limit now, but the show itself is speeding up! The pace really gets going this week as we get more information about the Roci’s surroundings, about the Mao family, about Naomi’s loyalties, and about Holden’s focus. Life-changing events are often created by the right person being in the right place at the right time, and in this episode of the Expanse, we see various ways in which this plays out. Join us as we discuss Holden’s state of mind, the Behemoth crew’s decisions, and much more in this episode of The Tightbeam!